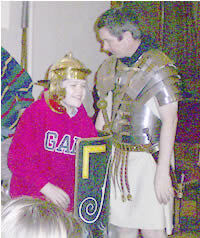 This month’s YAC session looked at daily life in the Iron Age and the Roman invasion. Members were set the task of identifying a series of jobs that Iron Age people would have done. Then they had to work out what archaeological evidence would be left and how they, as archaeologists, could use this to prove what people were doing in the past. Having solved this puzzle members were then set the challenge of using their detective skills to interpret an archaeological site. Each team of archaeologists was given a site plan, some environmental data and access to real pottery and animal bones. From this they had to work out as much as possible about the people who lived on the site in the past. 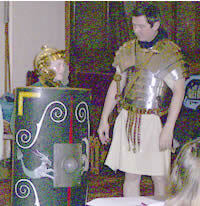 Then half way through the session they were ‘invaded’ by Optio Lucius, a Roman soldier. He came along to tell them not only about the Romans, but to explaine how all the different bits of his outfit had been reproduced using REAL archaeological evidence from the local area!